Summer time has hit and salads are on the menu! I have 19 Amazing Salad Dressing Recipes that you must try this season to take a simple salad from meh to WOW. 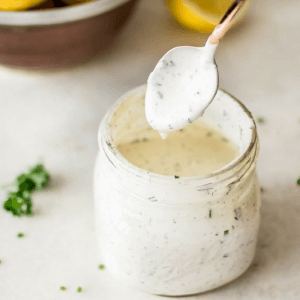 Homemade Ranch Dressing from Salt & Lavender because a classic is always a good idea. 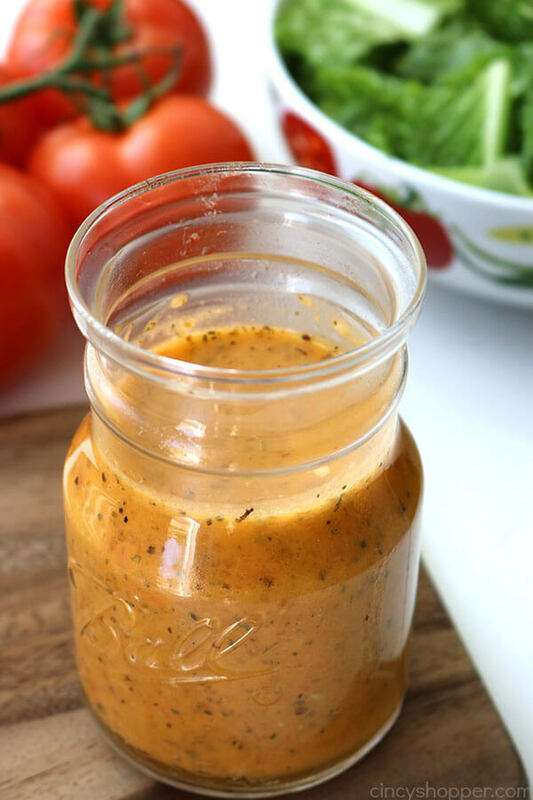 Homemade Tomato Vinaigrette from The Cincy Shopper is perfect for your garden supplies you with an abundance of tomatoes this summer. 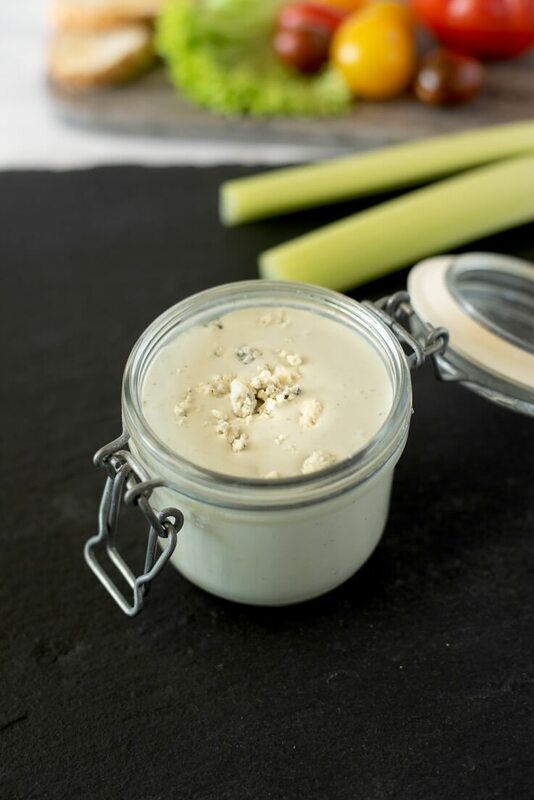 Chunky Blue Cheese Dressing from Culinary Ginger perfect for dipping or drizzled over salads. 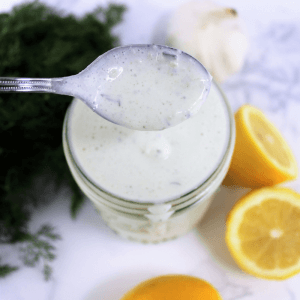 Basil and Lemon Vinaigrette Dressing is a simple, gluten-free, dairy free dressing from Evolving Table. 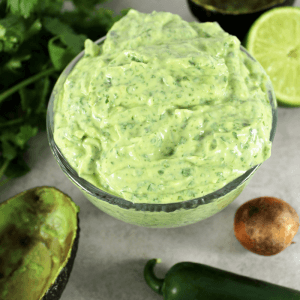 Vegan Cilantro and Cayenne Tahini Sauce might just become your next go-to sauce for.. well… everything from Foodal. Easy Homemade Greek Dressing from Peas and Crayons is beautiful and delicious. 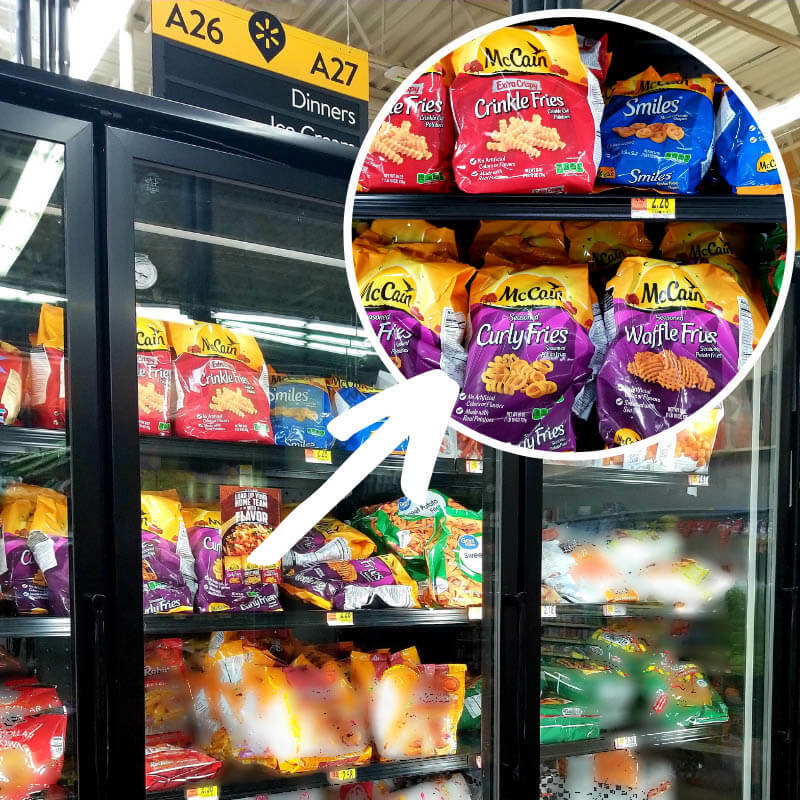 Go ahead and ditch the store bought. 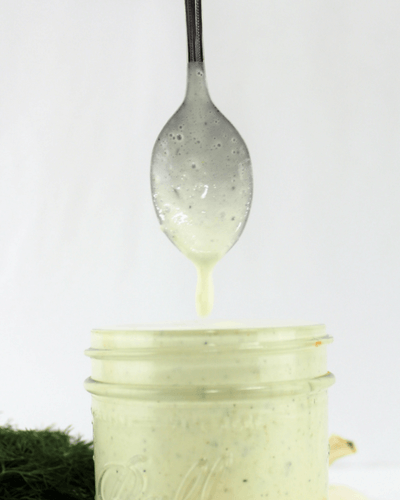 Honey Mustard Ginger Salad Dressing from Natalie’s Happy Health. Homemade Balsamic Vinaigrette from To Simply Inspire. 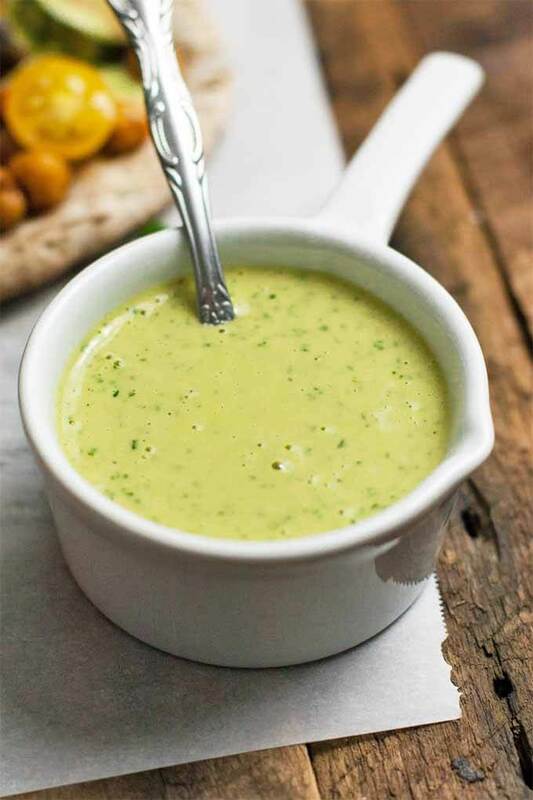 Creamy Maple Curry Salad Dressing from Delicious on a Dime. 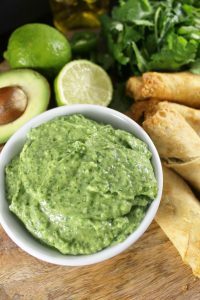 Avocado “Bomb” Sauce from here at Simply Made Recipes. 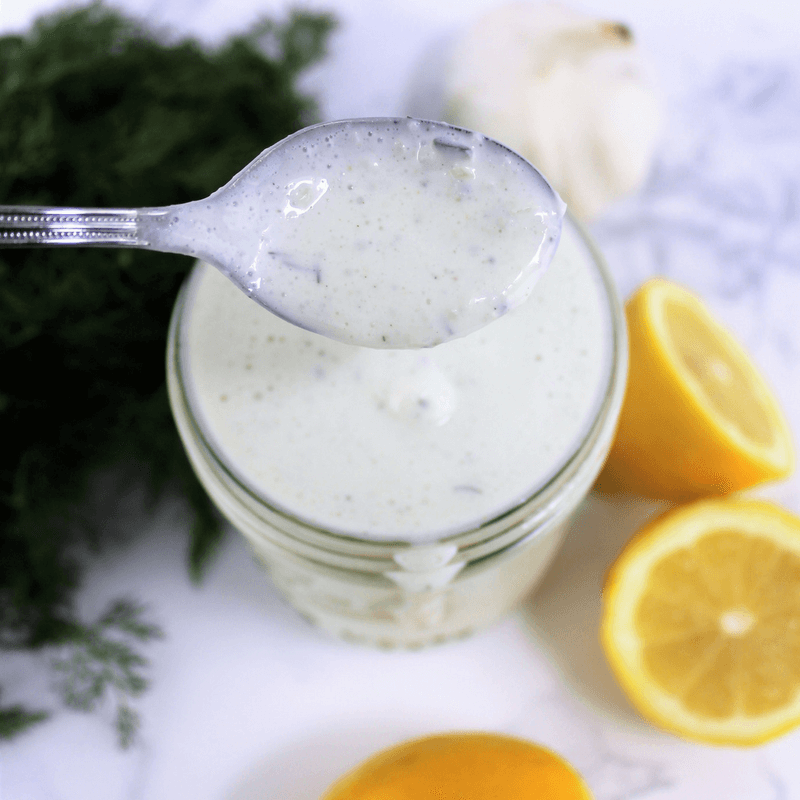 Citrus Vinaigrette Dressing from Low Carb Maven. Joy Filled Eats shows us How to Make Caesar Salad with 4 Ingredients. 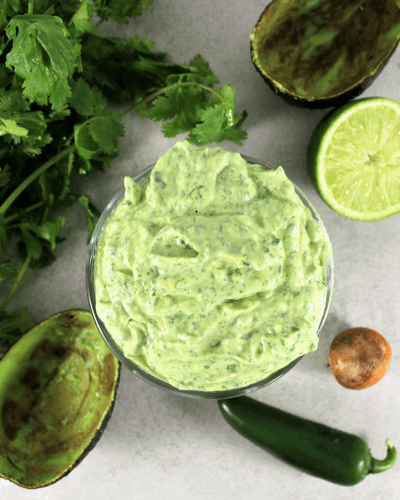 Mojito Salad Dressing from It is a Keeper. Thousand Island Dressing from Thyme & Joy. 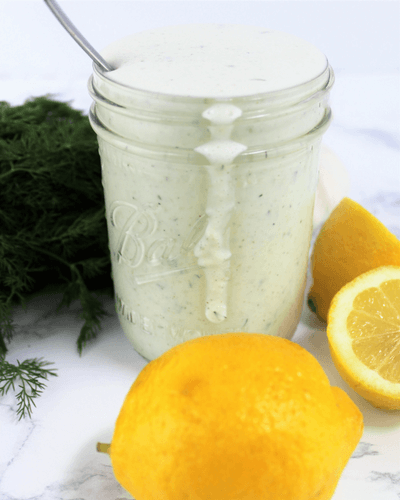 Creamy Honey Lime Salad Dressing from Syrup and Biscuits. Strawberry Vinaigrette from Mom Foodie. Keto Russian Dressing from Peace. Love and Low Carb. 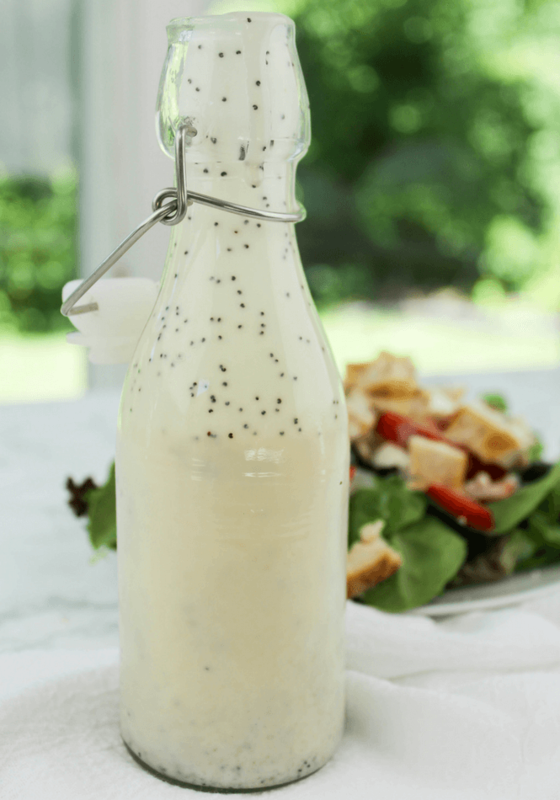 Poppy Seed Salad Dressing from here at Simply Made Recipes. Homemade Antipasto Dressing from Bunny’s Warm Oven. There you have it! 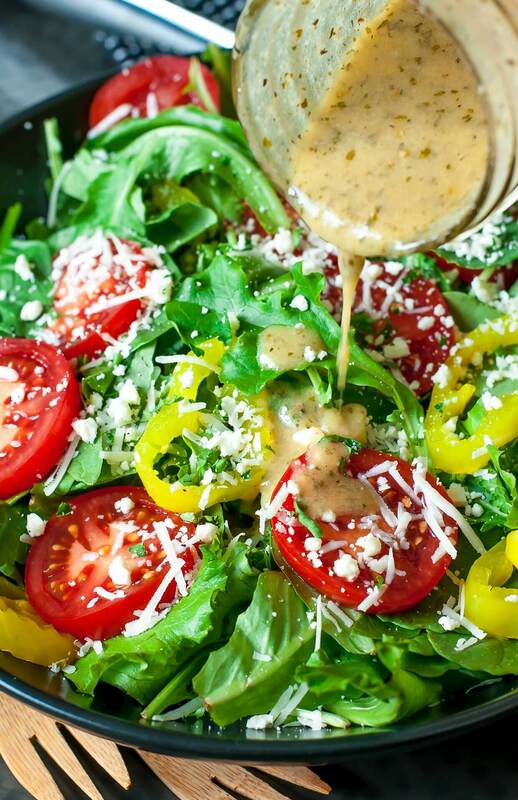 19 Amazing Salad Dressing Recipes are up for grabs. I just want to know, which one will you start with? 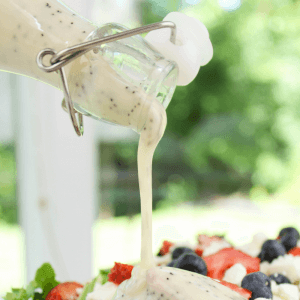 Creamy Poppy Seed Salad Dressing is made with mayonnaise, poppy seeds, apple cider vinegar and sugar for a really easy salad dressing ready in under 5 minutes. Poppy seed dressing is one of my favorites. 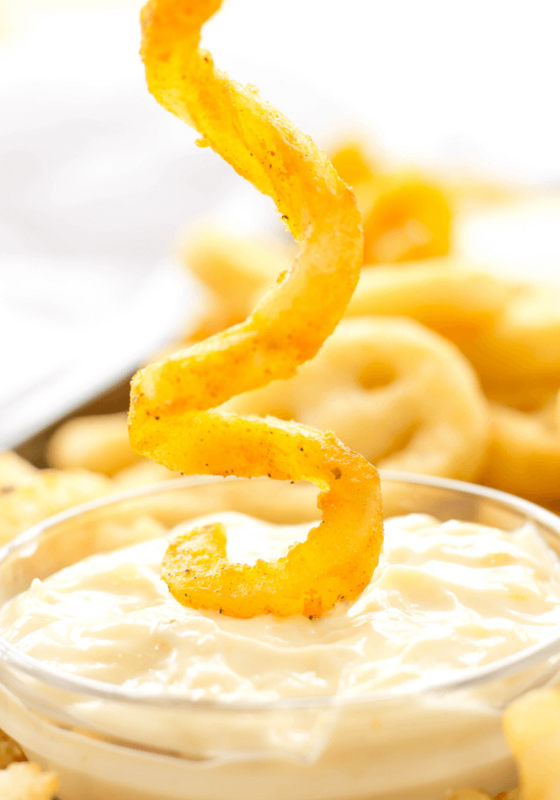 This particular one has a mayonnaise base making it really creamy and tastes oh so delicious on so many foods. Pour over a seasonal salad, drizzle a bit in a wrap of turkey, lettuce, veggies folded in a tortilla or even use as a dip for chicken tenders. 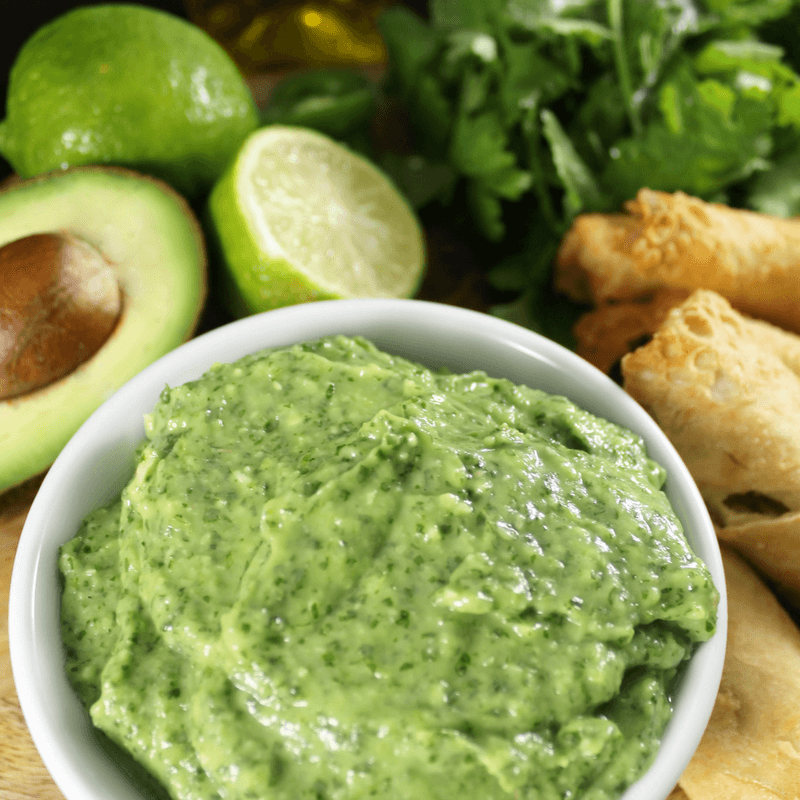 Drizzle over salad, in a sandwich wrap or use as a dip. 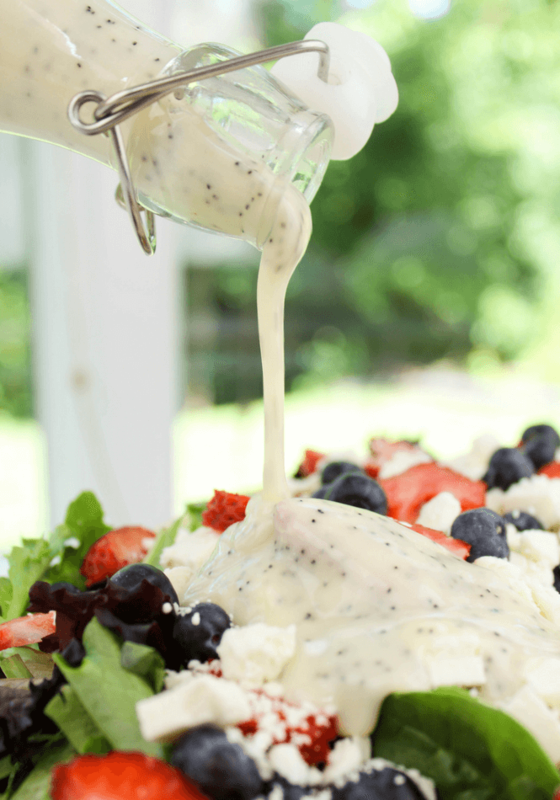 What will you use this Creamy Poppy Seed Dressing recipe for? Let me know in the comments below. 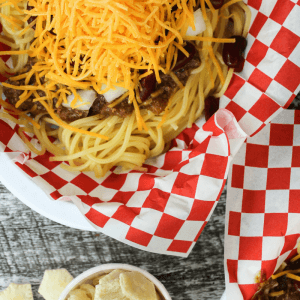 Cincinnati Style Chili slow cooked in the crockpot with ground beef and spices topped with red beans, onion and a pile of cheese on a bed of spaghetti. When I first moved to Cincinnati a few years back everyone raved about the chili here. 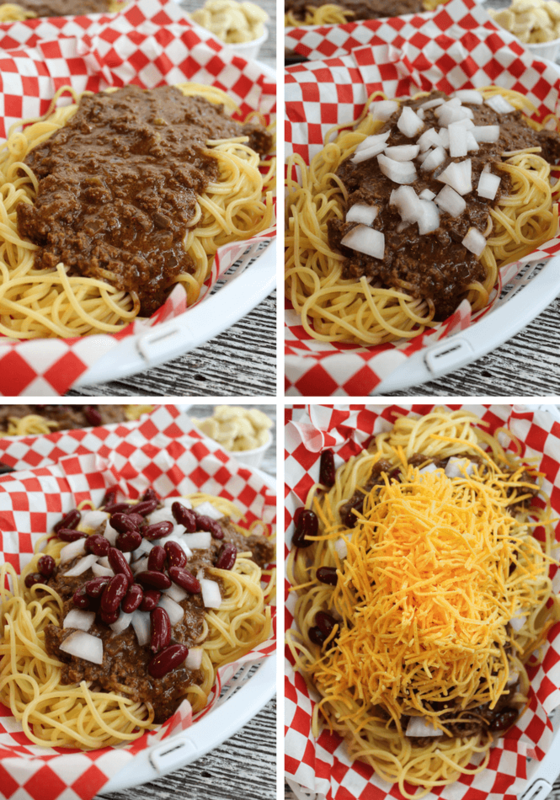 It took me awhile to get the courage to try out a Cincinnati Style Chili because it is different than what us West Coast people are used to but it is delicious. 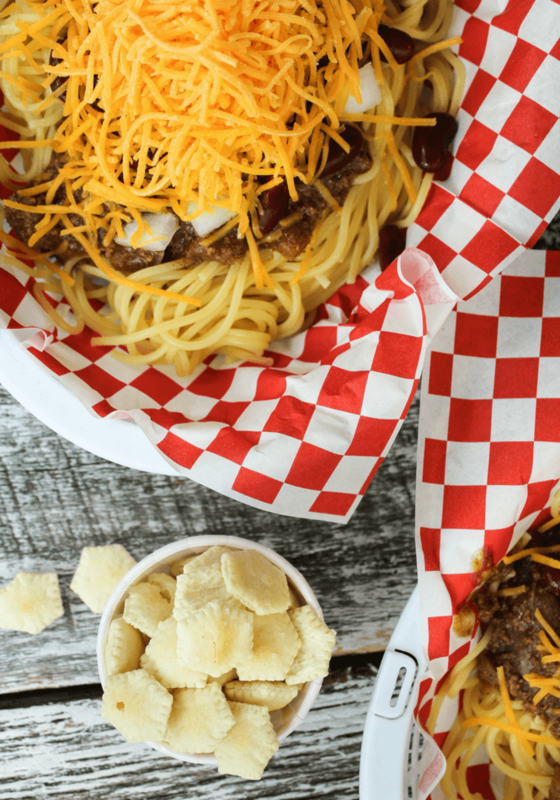 There are a few things that make Cincinnati Style Chili special. The first thing you will notice is the obvious serving over spaghetti with a huge pile of shredded cheddar cheese on top. The next is the chili itself. You get a lot of cinnamon and cocoa flavors and the chili, although very meaty, has more of a sauce consistency in comparison to a chunky Texas style chili. To get the consistency correct, you do not want to brown the meat before placing into the crockpot. Chop the onion and place in crockpot and break up the meat inside your slow cooker. Add the rest of your ingredients and let cook on low all day. We are creating a “5 way” today. This is how a popular chili joint here in Cincinnati does it and you can opt out on any step to build it the way you like. I am not a raw onion fan so I leave the onion off. Start with a heaping portion of cooked spaghetti. Place a couple ladles worth of chili on top. Sprinkle with chopped raw onion, then drained canned kidney beans. Now for the cheese! 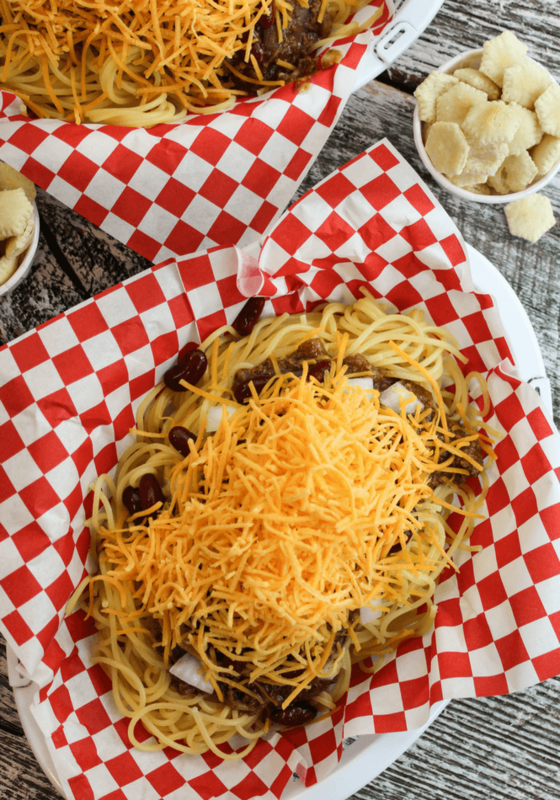 Cincinnati Style Chili is not complete without the shredded cheddar cheese. Place a large portion on cheese on top and you are ready to eat. Hot sauce and oyster crackers are also a nice addition and traditionally served with chili here in Cincinnati. 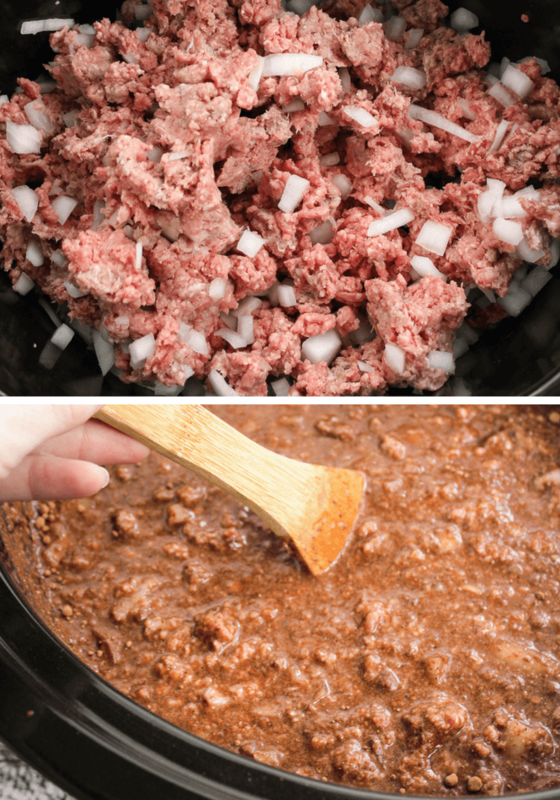 Chop one onion and place into crockpot with the ground beef. Break up the ground beef and add tomato sauce, red pepper, cumin, chili powder, cocoa powder, minced garlic cloves, vinegar, salt, cinnamon and a bay leaf. Slow cook on low 6-8 hours and remove bay leaf. Cook spaghetti according to box instructions. Chop the other onion and drain your kidney beans. 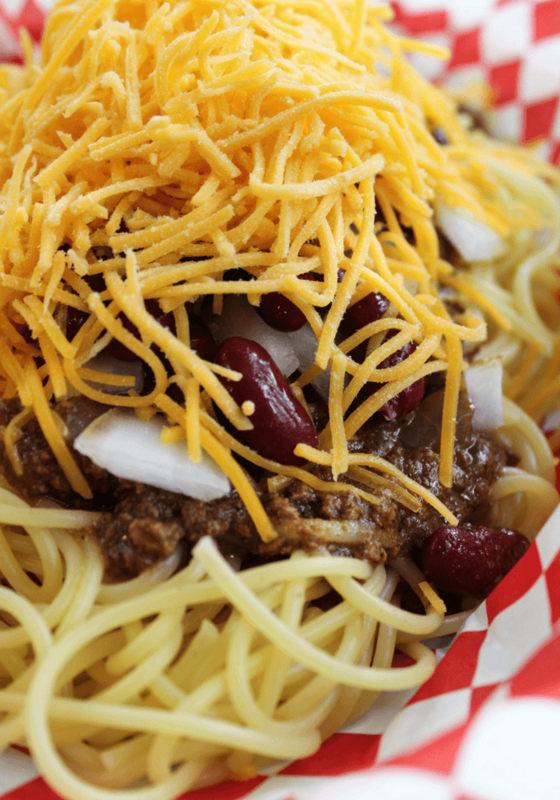 Stack your "5 way" with spaghetti, chili, onion, kidney beans and a pile of cheese. Serve with oyster crackers and a dash of hot sauce. 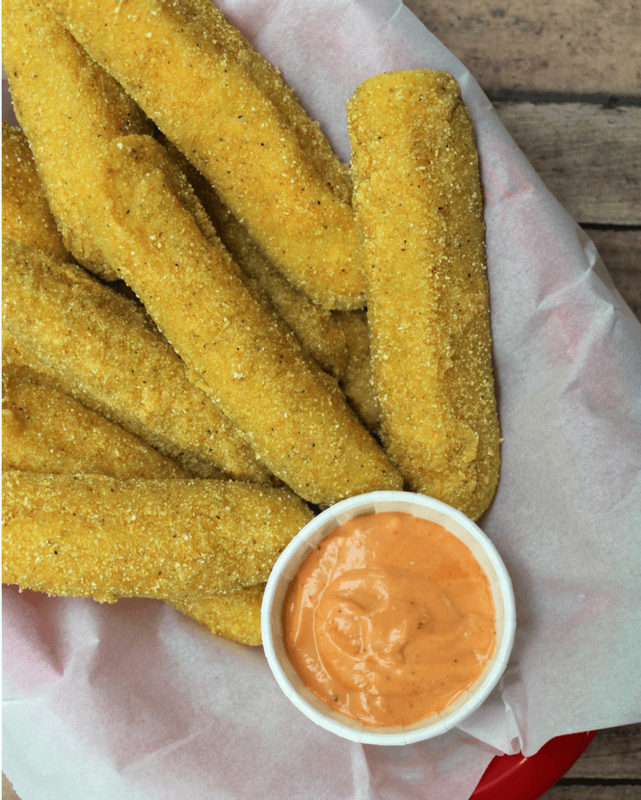 Fried Cornmeal Pickle Spears made with dill pickles coated in buttermilk, flour, cornmeal and seasonings dipped into a yummy fry sauce. Those Fried Pickle Burgers from a few weeks back have me craving fried pickles so I just had to make a delicious appetizer! In my opinion the best fried pickles, are nice and crispy on the outside and come paired with a spicy sauce for dipping. I am a big sauce gal. I like dipping everything. You are going to love this sauce! 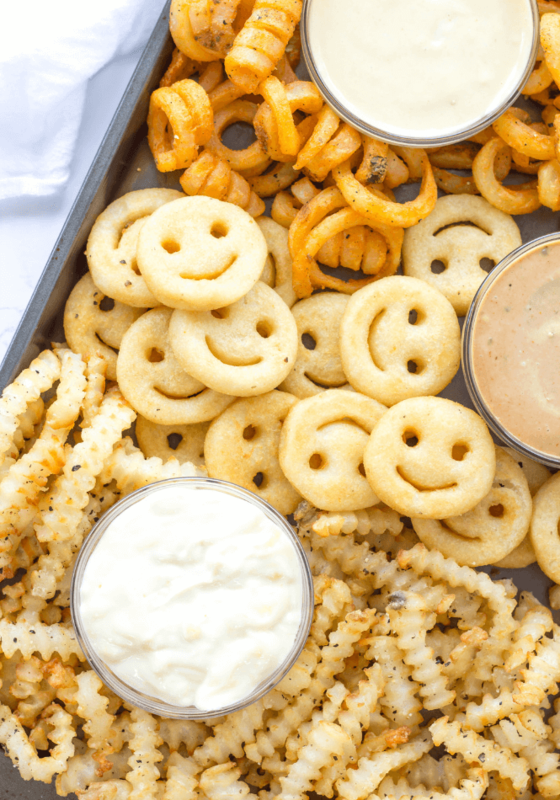 It is a recipe you will use again and again for lot’s of different foods like fries, fried onions or even on top of a burger and used as a sandwich spread. 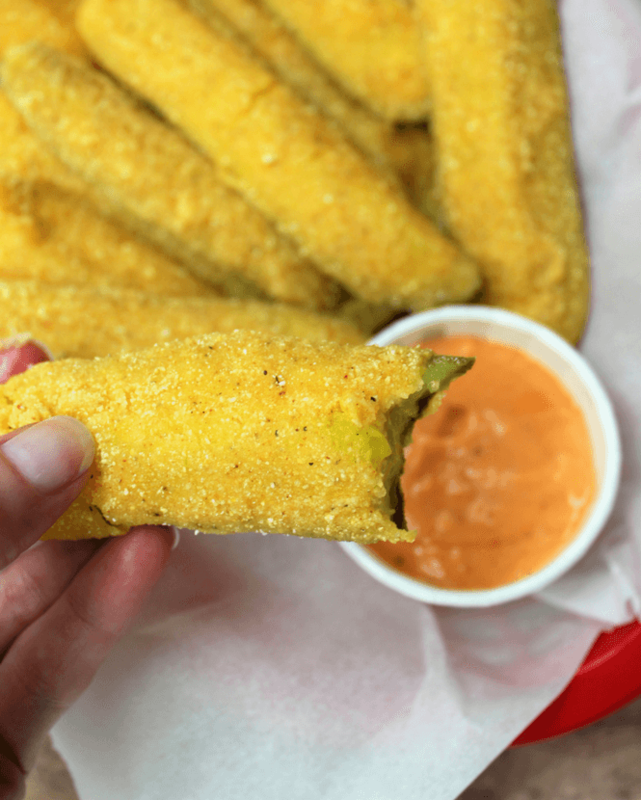 There is one big secret for perfect fried pickles: make sure your oil temperature is right at 375 degrees. You will need a thermometer to do this. 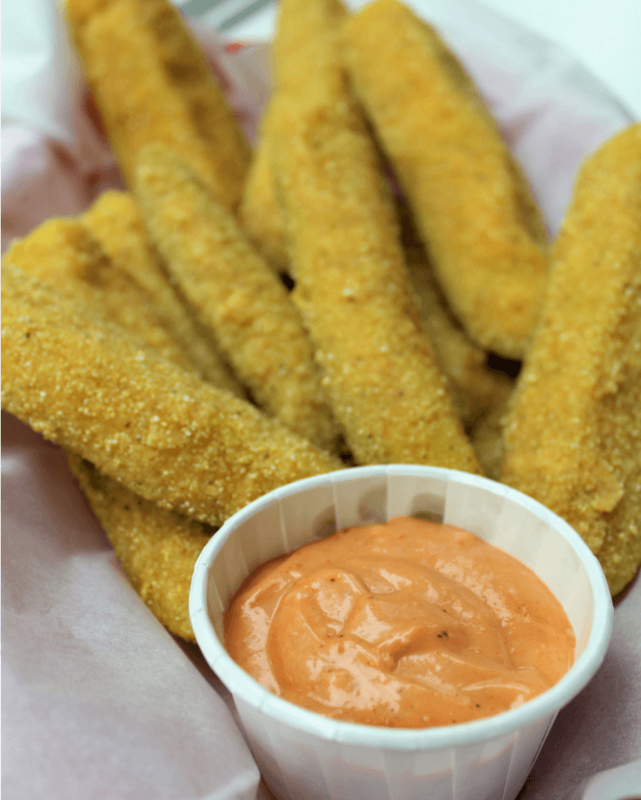 Also, the pickles do not take long to cook so keep a close eye on them while frying. On the stove top, add about 1 inch of oil to a large pan. You can use oil of choice. I have used vegetable and peanut oil and both work well. You will need a thermometer to make sure the oil is at 375 degrees. In a small bowl, mix all the sauce ingredients together and set to the side while the oil is heating up. Drain the pickle slices. Pat dry. Grab 2 bowls. Add the buttermilk and eggs in bowl #1. Add cornmeal, cayenne, pepper and flour in bowl #2. Each pickle needs to be dipped in bowl #1 and then coated in bowl #2. Set coated pickles on a large plate. Repeat process until all the pickles are coated. In small batches, add the coated pickles to the pan with oil at 375 degrees. Cook around 2 minutes or until golden brown flipping half way through. Remove from oil and place on paper towels. 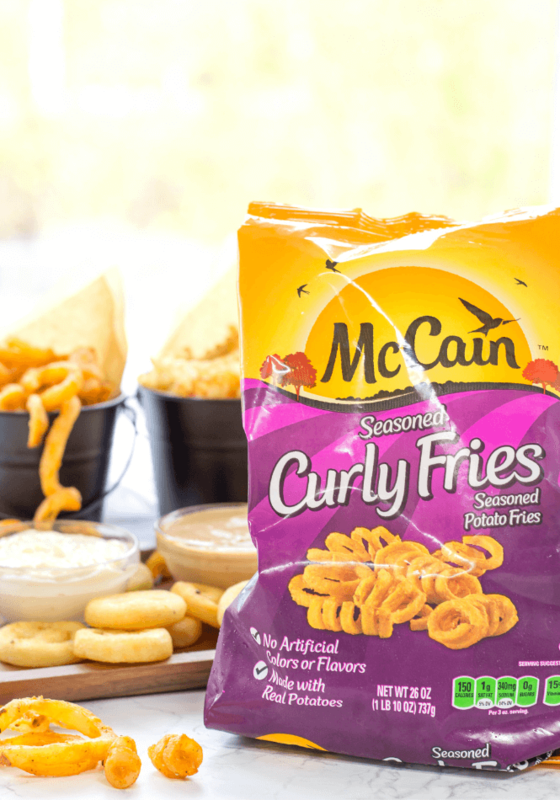 Repeat until pickles are all fried. 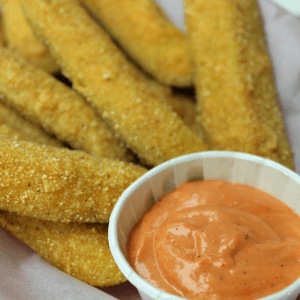 Dip fried pickles in sauce ad enjoy! 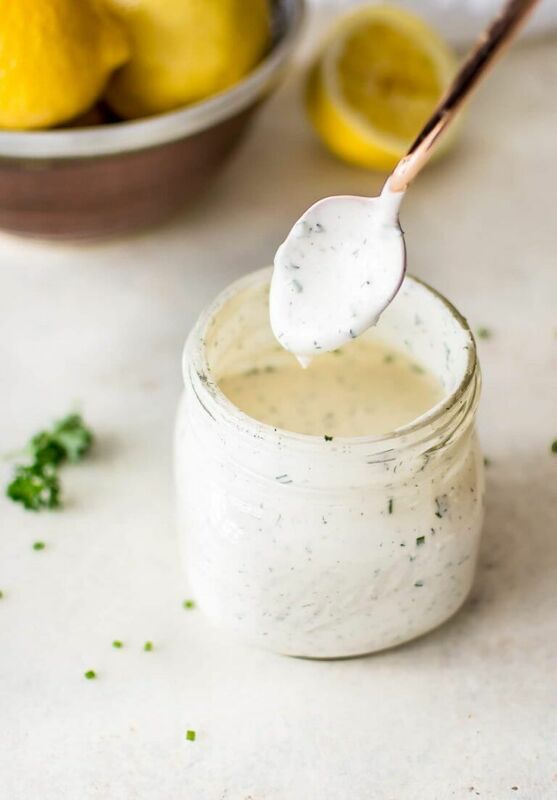 Tzatziki Sauce is a multi purpose sauce for Greek dishes with cucumber, garlic, lemon, fresh dill and Greek yogurt. 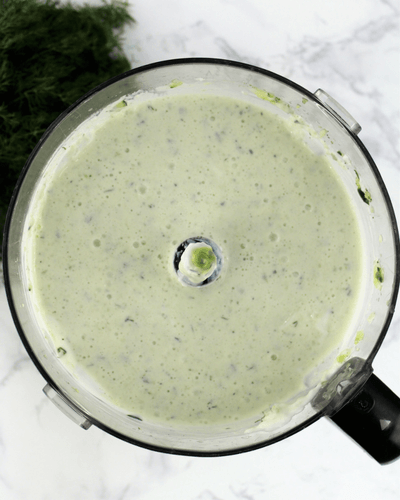 I love the combination of fresh ingredients and creamy base that makes this sauce a must have recipe! There is a great little Farmer’s Market here in downtown Cincinnati that has the most addicting gyros. We drive downtown, pay for parking and deal with large crowds just for these gyros. I crave them constantly. 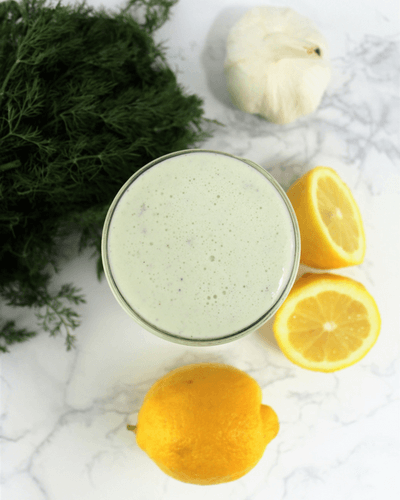 This recipe was inspired by their tzatziki sauce with the cool cucumber flavor and fresh taste. The sauce is really simple to make. 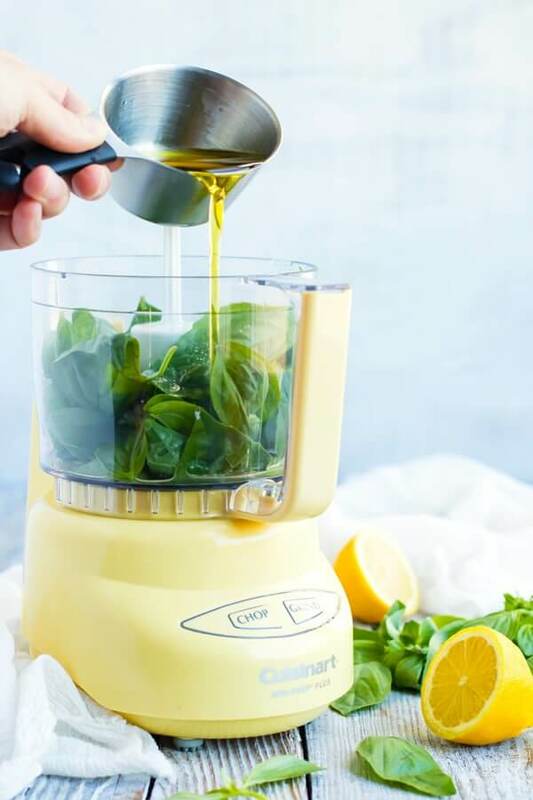 All you need is a food processor, cutting board, knife and measuring cups. Blend your sliced cucumber with some salt before adding the other ingredients so the cucumber flavor is consistent. Salt has a way of thinning out sauces so it is important to add it in to start with the cucumber. 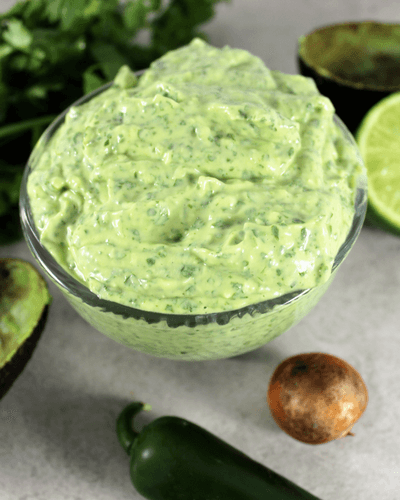 Once you add the Greek yogurt and other ingredients, it makes a nice creamy sauce that is ready to go in just a few minutes. This particular tzatziki sauce is on the thinner side as far as sauce goes. What do you do if you want a really thick sauce? There are some options. 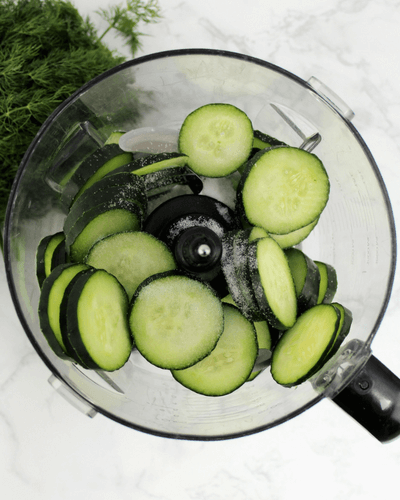 You can finely chop your cucumber and squeeze the excess water from it and opt out of the food processor to just whisk the ingredients together. I don’t like this way personally because you have chunks of cucumber, instead of having the flavor all through the sauce. Still tastes amazing this way though! You can also strain your yogurt. For starters, use the Greek yogurt over other types of yogurt because it is already thicker. You will then strain the yogurt using a coffee filter to get out the moisture. This can take some time and overnight straining is ideal. A third option for thicker sauce is some sort of thickening agent, such as a gelatin. 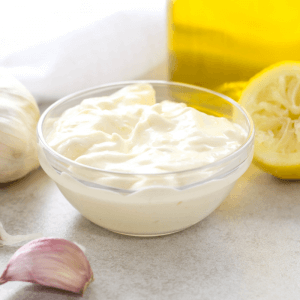 How long does tzatziki sauce stay good for? Go with the date of expiration of your yogurt but is best consumed immediately because the longer it sits, the thinner it will become. If you use a thickening method, you are safe to eat until yogurt expiration. However, this sauce really tastes best when consumed immediately after making. Try the Lamb and Feta Nacho recipe for your tzatziki sauce. Grab ingredients, food processor, garlic press, knife, cutting board, measuring cups and storage container for sauce. 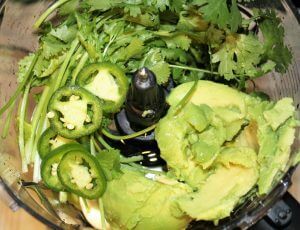 Slice your cucumber and put into the food processor. Ad 1 teaspoon salt. Blend for one minute. Add 1 tablespoons fresh chopped dill, 1 more tablespoon salt, 1 tablespoon pepper, 3 tablespoons lemon juice, 3 cups Greek yogurt and mince 1 garlic clove. Blend 30 seconds. Pour into a storage container. Expires at yogurt expiration date. 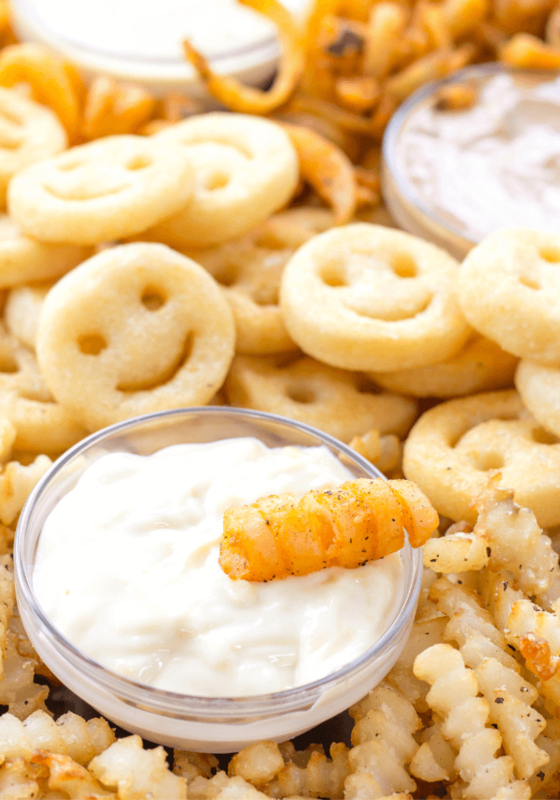 Put on your gyros, greek nachos, salads, use as a dip, on burgers or whatever else you can think of. Pancakes with Strawberry Sauce with the recipe for our Perfect Pancakes made from applesauce with a fresh strawberry syrup drizzled over top. A dab of cool whip and you have a perfect start to the morning. My grandmother would always strain the strawberry sauce to remove the strawberry chunks so you would be left with a nice, consistent syrup. I prefer to leave the strawberry chunks in but you can do either way. Children can be strange about things like a chunk of strawberry and if you have kids, you know this already so strain or not to strain is completely up to. 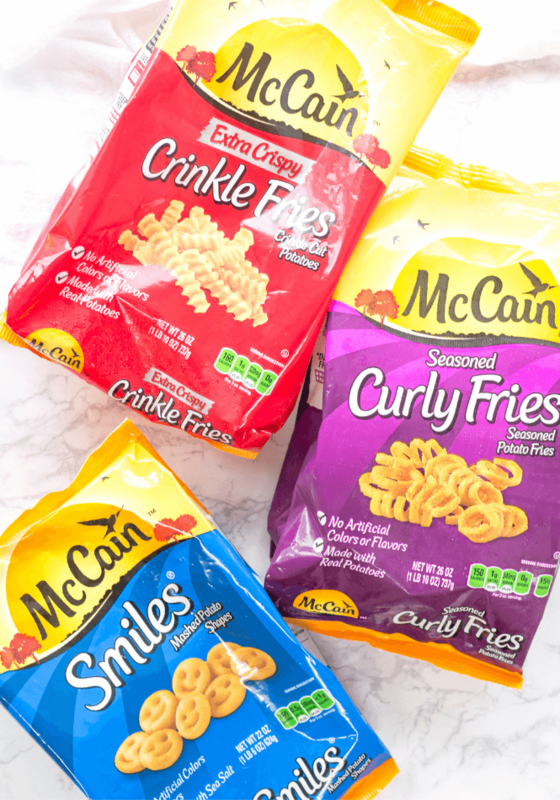 Tastes great, regardless and the flavor is all there. You may also add some red food coloring to brighten up the sauce. Personally, I have chosen to not let my kids eat red dye and its not necessary but does make the color vibrant and bright. Gather ingredients, electric skillet, bowl, kitchen utensils, measuring cups, pan, potato masher, whisk and cooking spray. Preheat skillet to 350 degrees. Add all pancake ingredients in large bowl and whisk until well blended. Spray the skillet with the cooking spray and add pancake mixture. This mix will make 10-12 pancakes. Let cook until pancakes begin bubbling on top and are slightly brown on the bottom, approximately 3 minutes. This means it is time to flip. Cook on 2-3 minutes on other side and remove from heat. While the pancakes are cooking, begin the strawberry sauce. Place the pan on a medium heat, add the sliced strawberries with .5 cup sugar. Using a potato masher, squish the strawberries down to release the strawberry juices. On the side, mix 2 tablespoons cornstarch and 2 tablespoons water together, then add to pan. Let sauce simmer until thickened and remove from heat. At this point you can choose to strain the strawberry sauce or not. I keep the chunks in. Assemble a stack of pancakes and pour strawberry sauce on top with a bit of cool whip if you choose. Rice bowls are a big deal in our family, especially these Grilled Beef and Broccoli Bowls with a homemade teriyaki sauce. So easy to make, just throw some rice in the rice cooker or on the stove top and mix together a simple teriyaki sauce with the perfect saltiness and a hint of ginger and garlic. During the summer, we use our grill for everything. Actually, this is a year round occurence. Aaron has been known to grill a nice salmon or steak in 10 degree weather out on the deck. You just can’t beat that nice grilled flavor. Want a time saving tip? Make the teriyaki sauce ahead of time in a large quantity to store in fridge for use anytime. 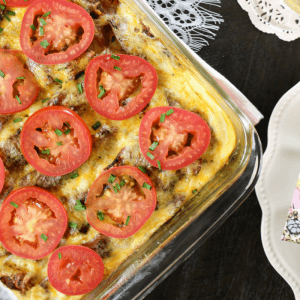 Gather ingredients, rice cooker, measuring cups, knife, foil, cutting board, large bowl, pan, whisk, garlic press, skewer sticks, and prepare your grill. Get your skewer sticks soaking in water if they are the wood ones like ours. This helps prevent splintering while on the grill. On the stove top, prepare your homemade teriyaki sauce. On a medium heat, add 1/4 water, 1/2 cup soy sauce, 2 tablespoons red wine vinegar, 1 tablespoon plus 2 teaspoons brown sugar, 1/4 cup sugar into the pan and whisk. Use your hand grater to grate 1 garlic clove and an even amount of fresh ginger, should equal around 1.5 teaspoons. Continue to whisk until sugar has dissolved. Set sauce to the side. Wash broccoli and cut up. Put to the side. Cut your 1.5 pounds of sirloin into cubed bite size pieces and set into bowl. Pour about half the teriyaki sauce into the bowl to marinate the steak. Begin cooking rice according to package directions. Pick any rice you please. I dump ours into the rice cooker and if you don't have one I recommend to buy one. So easy to throw some in the rice cooker and walk away or before I go to work, set the timer so rice is ready at dinner time. Prepare the broccoli you set to the side earlier. Grab some foil and throw the broccoli on it mixed with a little olive oil and salt and pepper. Give a little mix and cover completely with foil. Set on grill for 15 minutes. Put the marinated steak cubes onto the skewers as the broccoli begins to cook. Set on the grill for 10 minutes turning often. Now that everything is cooked, Put some rice in a bowl, add the grilled broccoli and top off with a steak skewer. Pour some of that extra teriyaki sauce on too if you would like. Enjoy!